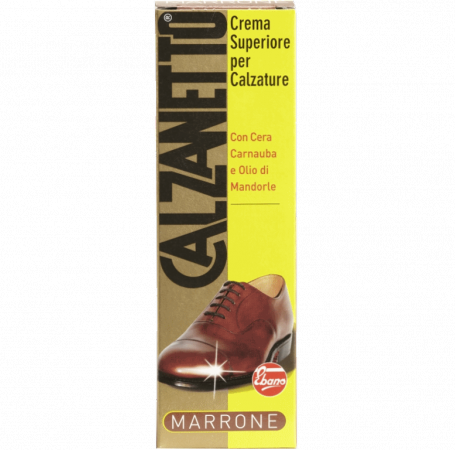 It is a cream for footwear with basic formula of 1926 that retains most of the time part of ingredients. The blend of fine waxes, solvents, pigments, and water makes it a high quality product, easy to apply, high-nutrition, high gloss, good recolored power and discrete water-repellent. It used with appropriateness and regularly provides the skin a state of health, more than satisfactory protection and conservation. This product is also available in dark brown, neutral, black and bleu. Remove any dirt, apply a small quantity of Superior Footwear Cream on the brush or a cotton cloth, then spread it evenly on the skin of the shoe. Leave on for several minutes, and then rub vigorously with a soft cloth. Repeat several times a week to always have recolored shoes, fed, protected and polished.